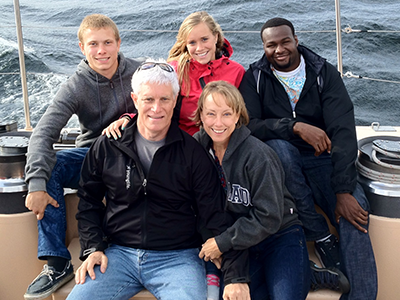 Convinced at the Inter-Varsity Urbana Mission Conference in 1977 that God was calling him to the Muslim world, Torrey finished his education and served as a missionary for a year in Chad, Africa with TEAM mission. After seminary and ordination, he led a Students-Singles ministry of 500 at South Presbyterian Church in Denver. After the 1987 Billy Graham Crusade in Denver, Torrey joined Billy Graham’s Mission World Team in London, England overseeing outreach to French speaking West Africa. After this assignment, Torrey and Kim were married in 1990 and moved to Mali, West Africa where they (and soon their 3 children) lived for 9 years and where Torrey was WV’s national director. They spent another 6 years in Senegal, West Africa where Torrey was also WV’s national director. In 2004, the Olsens moved to WVUS’s Seattle area office. Torrey has led WV’s Christian Witness programs from this office since. Torrey’s conviction from life and ministry in nine countries, two civil wars, two coups d’état is that the most important thing anyone can offer a culture or community is the good news of Jesus and a Biblical world view. Torrey’s passion for seeing the “good news to the poor” (Luke 4:17-19) beautifully integrated (i.e. proclamation, compassion and justice) has been his life’s motivation and mission especially to those who are the poorest and have the least opportunity to hear and experience this good news. Torrey is married to Kim. They live in Auburn, WA. They have three grown children and attend Grace Community Church in Auburn. "The Wheel of Development", Together, July 1992.